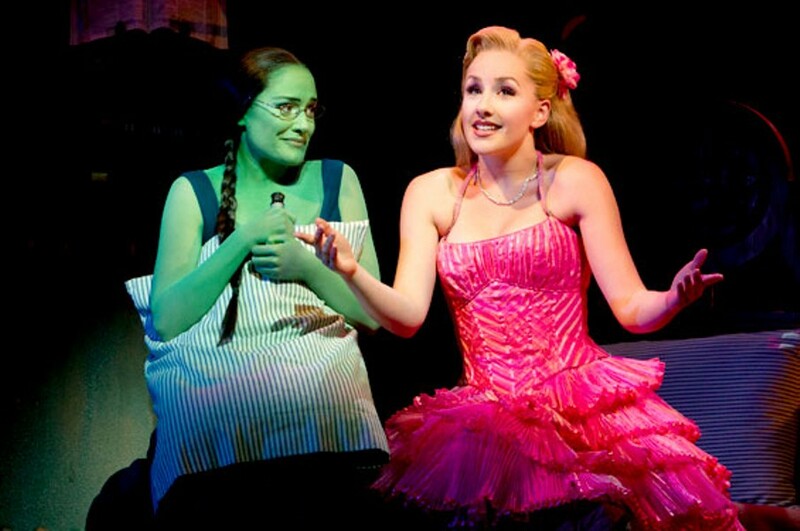 Joan Marcus Wicked, awesome: Jeanna de Waal as Glinda and Christine Dwyer as Elphaba. 527 North Grand Boulevard. Tickets cost $38 to $165. Funny thing about goose bumps. I tend to associate them with my arms. But early in "Defying Gravity," the now-iconic Act One finale in Wicked, as Elphaba and Glinda's two voices blended together to create a pure line of musical sound on the lyric, "I hope you're happy right now," without warning countless goose bumps began to tingle down around both of my ankles and rushed to my knees. 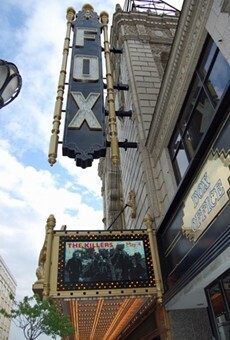 Mine was not an isolated response: As the song continued to soar ("So if you care to find me/Look to the western sky"), there was a sense that the entire Fox Theatre audience was levitating from sheer bliss. Unless you've been hibernating in Munchkinland for the past decade, you know that Wicked, which has returned to the Fox to enchant theatergoers through the holidays and into the new year, retells the oh-so-familiar Wizard of Oz story through the eyes of Elphaba, the Wicked Witch of the West. You also might recall that when Wicked debuted on Broadway in 2003, it was dismissed by some of the major reviewers and was largely ignored at Tony time. But despite its slights, the show has triumphed. To see Wicked again is to be reminded that it is a savvy blend of craft, intelligence and imagination. Although it does posit a clear-cut message about the quiet terrors of individuality and the need for acceptance, mostly it sings. The ebullient, addictive score by Stephen Schwartz heaps melodies upon the viewer like an unceasing star shower. This is Wicked's fourth visit to St. Louis since 2005. In a musical that is already a veritable Pandora's box of surprises, perhaps the biggest surprise of all is that the production still feels so crisply sharp. Aren't national tours supposed to get leaner, cheaper and more frayed as the years go by? This one hasn't. Thanks to spirited performances like the one by Billy Harrigan Tighe as the fun-loving Fiyero, the production retains its vibrancy. Wicked remains what it always has been: a flawed splendor. Act One has so much sassy fun establishing the hate-love relationship between the antisocial Elphaba and the materialistic Glinda (later to emerge as the Good Witch of the North) that Act Two becomes overcrowded with plot resolutions. The abrupt change in tone creates a problem for any actress who plays Glinda. In Act One she is a comedian; in Act Two she rather (too) abruptly transitions to long-suffering and mature. Jeanna de Waal smoothly glides through the first act but is less effective after she loses her long blond tresses and has to grow up while retaining an occasional sense of irony. Elphaba, the better-written character, is a veritable kaleidoscope of variety and change. Christine Dwyer plays the part with winning charm. Her eyes sparkle; the clean line of her facial profile directs the eye to a bewitching ski-lift chin. If Dwyer's singing voice lacks the furnace blast of previous Elphabas, she seduces us with warmth rather than fire. While most Elphabas stake their claim to ownership of the role early on in the brassy "The Wizard and I," Dwyer bides her time. Her first take-no-prisoners moment occurs in the more plaintive "I'm Not That Girl." Without so much as raising her voice, by song's end she holds us in thrall. From that moment on, Dwyer is on a roll. But then in Act Two she must confront the daunting "No Good Deed," a treacherous gauntlet that has been the Waterloo for many an Elphaba. Not to worry. Dwyer soars through this howl of incantations and chants with confidence and aplomb. Anyone who is about to see Wicked for the first time will have the assurance of knowing that they're seeing an A-team production; those who are returning to see the show again need not worry about feeling shortchanged. And those who want to return but need a good reason to be persuaded can find that new reason in two words: Christine Dwyer.